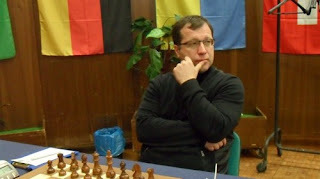 Russian Grandmaster Aleksey Dreev has won the European Rapid Chess Championship 2012 that was held on 15-16th December at The Palace of Culture and Science in Warsaw, Poland. A total of 753 players from the European federations (FIDE Zones 1.1 to 1.10) competed in the 11-round Swiss event with the time control G-15′+10”, according to a Chessdom report. Eventually four players shared the first place with 9,5 points each: Aleksey Dreev, Maxime Vachier-Lagrave, Alexei Shirov and Sergei Rublevsky. Dreev had the best tie-break score and is declared Champion. Maxime Vachier-Lagrave, who two days earlier became European Blitz Chess Champion, this time took the silver medal. Shirov is awarded with bronze. The prize fund of 20,000 € was distributed to 25 regular and 28 special prizes. The winner took 4,000 €. 14-26. GM Sargissian Gabriel ARM 2666, GM Moranda Wojciech POL 2559, GM Petrosian Tigran L. ARM 2648, GM Gajewski Grzegorz POL 2644, GM Kulaots Kaido EST 2537, GM Romanov Evgeny RUS 2589, IM Tazbir Marcin POL 2555, GM Gritsak Orest UKR 2549, GM Fedoseev Vladimir RUS 2629, GM Miśta Aleksander POL 2562, GM Tomczak Jacek POL 2558, GM Jussupow Artur GER 2611 and GM Klimov Sergey RUS 2453 – 8.5 etc. Official website. Interesting Chess Magic: Is it Camera Trick?